Where is Apple's 5K Thunderbolt Display? It is approaching five years since Apple began shipping the Thunderbolt Display in September 2011, leading many to wonder when the monitor will receive a long-anticipated update, if ever. Apple could have refreshed the Thunderbolt Display with USB 3.0, Thunderbolt 2 and a tapered iMac-style design as early as 2013, but Apple has chosen not to do that. The company continues to sell the 2011 27" model with USB 2.0 and first-generation Thunderbolt ports for $999. So, what has been the holdup? The answer likely lies in supply chain considerations and connectivity. Many have been long hoping that Apple would release a 4K Thunderbolt Display, considering that the latest Macs, and most models refreshed since late 2013, can be used with one 4K display. But, typically, standalone Apple displays have shared the same screens as iMacs. Since Apple skipped over a 4K iMac, Apple would have to source a separate screen to release a 4K Thunderbolt Display, and the product may be too niche for that to be worthwhile. Meanwhile, with Thunderbolt 3 rolling out this year, it seems unlikely that Apple will bother with a refreshed non-4K Thunderbolt Display in the interim. So, as time goes on, the more likely possibility is that Apple will eventually release a much improved 5K Thunderbolt Display. 5K displays have an incredible 14.7 million pixels, resulting in sharper and crisper images, but they remain expensive. 5K models from Dell and HP retail for between $1,649 and $1,999, while Apple's all-in-one 5K iMac starts at $1,799, but cannot be used in target display mode. 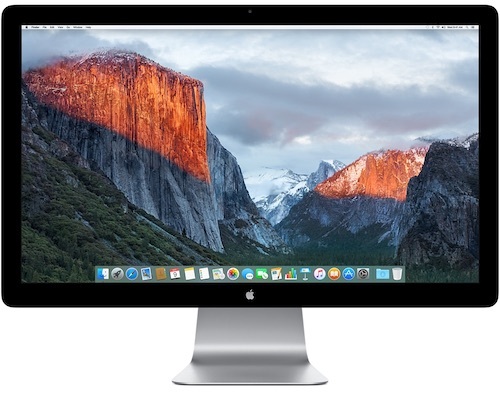 Apple already sells a 27" Retina 5K iMac, and its screen could be the basis for a corresponding 5K Thunderbolt Display. The display could share the same 5,120×2,880 resolution, USB Type-C ports for connecting Thunderbolt 3 peripherals and possibly an ultra-thin design like the newest iMacs. But no current Macs could drive such a 5K display over a single cable. Apple won't release the first Macs with Intel's new Skylake chips and Thunderbolt 3 support until later in 2016, and only those models will be able to drive a 5K display at 60Hz over one cable. While that makes a 5K Thunderbolt Display a possibility in 2016, Apple has good reason to wait until at least 2017. Intel's Skylake processors, launching in early 2016, and Kaby Lake processors, expected to launch in the first half of 2017, will not be able to drive a 5K Thunderbolt Display over Single-Stream Transport (SST). The underlying issue is that both processor lineups lack support for DisplayPort 1.3. Instead, the display would sync two channels over Multi-Stream Transport (MST), which can cause some performance issues. That means Apple may wait until at least Cannon Lake chipset (which promise SST 5K support) in the second half of 2017, before releasing a 5K Thunderbolt Display. Because external displays are a relatively small market for Apple, it's possible Apple never plans to introduce an updated Thunderbolt Display. If a new model is in the company's plans, Apple will likely wait to introduce a 5K display until 2017 when most Macs can easily support it in order to maximize supply chain efficiency. If you are interested in exploring 3rd party 4K displays, read our 4K and 5K Display Buyer's Guide for Macs. Apple today confirmed it's giving up on making money in the mobile advertising business, and it will shut down the app network for its six-year-old iAd program on June 30th. The announcement, posted on Apple's developer website, comes just a few days after BuzzFeed News reported Apple's plans to disband the division's sales team due to poor adoption and minuscule revenue share. Apple is now no longer accepting new apps into the program, but current partners can continue existing campaigns and earn ad revenue up until the shutdown date. New campaigns can also be created using the iAd Workbench tool.